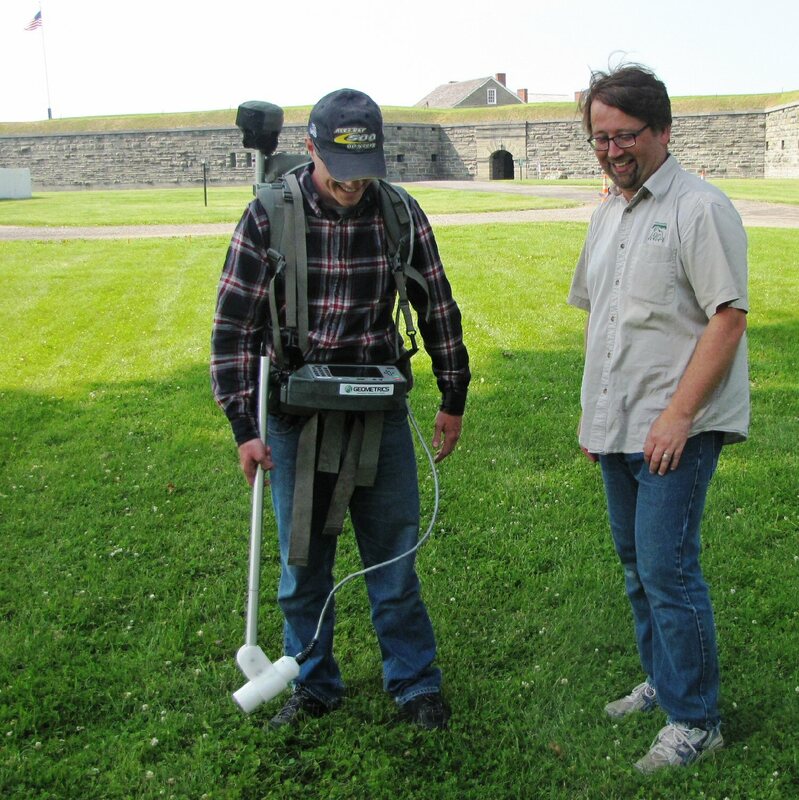 Dr. Graham Bradley of SUNY Oswego (right) and student-researcher Jeremy Fontaine are rediscovering the former locations of Fort George and Fort Ontario this summer in Oswego. This geoarcheological geophysical investigation is part of an undergraduate Faculty-Student Challenge Grant. The field work and interpretation will improve the understanding of the role of Oswego during the French and Indian War as well as improve the understanding of the operation of Fort Ontario during and following the Civil War. 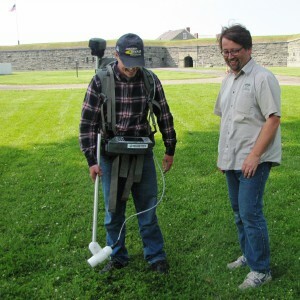 OSWEGO – This summer Dr. Graham Bradley of the SUNY Oswego Department of Atmospheric and Geological Sciences and student-researcher Jeremy Fontaine will try to rediscover the former locations of two historic forts in Oswego. They are collecting data at 18th century Fort George on the west side, and the 19th century support buildings at Fort Ontario. This geo-archeological geophysical investigation is part of an undergraduate Faculty-Student Challenge Grant. The exact location of Fort George in relation to the modern property boundaries is still unknown. Fort George is said to have been located around the homes in the Montcalm Park Historic District of Oswego. A plaque at the intersection of Montcalm Street and West Sixth Street commemorates Fort George. The location of support buildings at Fort Ontario is also unconfirmed. The final summary investigation report will be presented to SUNY Oswego, Fort Ontario, and the city of Oswego at the end of this year. Depending on the findings, results may also be presented at the Fort Ontario annual conference and the Geological Society of America Northeastern Section Meeting next spring. HOW VERY EXCITING!!! Can’t wait to hear about the results? A lecture/speaker on this sometime this Fall?? ?